Death is everywhere at the Getty Villa. 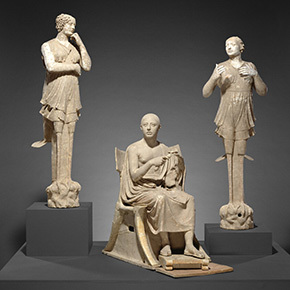 Every artist represented in this museum of ancient Greek, Roman, and Etruscan art is centuries gone. Every portrait bust, coin, and painting represents the long-deceased. Many of the objects once ornamented a tomb, or survived because they were interred in one. Several are themselves tombs. 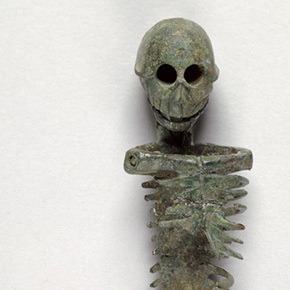 In honor of Death Salon Getty Villa, here’s a lively roundup of 15 of the deathiest objects of all, as chosen by Villa curators and educators. 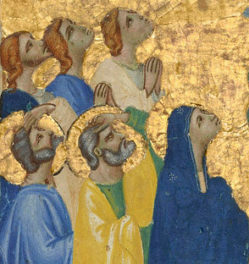 Objects are arranged by gallery, so you can begin at ground level and move heavenwards. Made immortal by the gods, gorgeous Adonis spent half the year with Aphrodite on earth, the other half with Persephone in the afterworld. That’s interesting: Because Adonis crossed between the worlds of death and life, this myth explained the seasons. The song of the Sirens lured sailors in Homer’s Odyssey to crash and die on hidden rocks. These alluring sirens, paired in a sculpture group with a poet, probably once guarded a tomb. That’s interesting: Sirens are usually depicted as part woman, part bird. 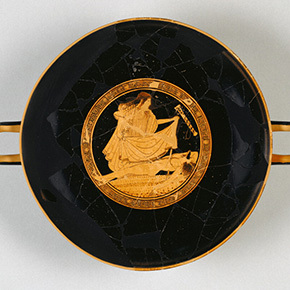 On this wine-drinking cup, Greek warrior Ajax has fallen on his own sword after losing out on a prize he deserved. That’s interesting: For the ancient Greek hero, suicide was an acceptable response to dishonor. 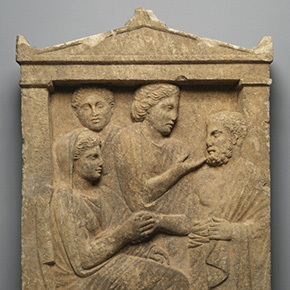 This memorial for an ancient Greek mother shows her surrounded by her husband and adult children. That’s interesting: The handshake is thought to represent family unity after death. The moon goddess, Selene, keeps her youthful lover Endymion asleep forever so he won’t age and die. His peaceful sleep is like the eternal slumber of death, only sexier. That’s interesting: To ensure Endymion does not wake, the god of sleep pours poppy juice on him. 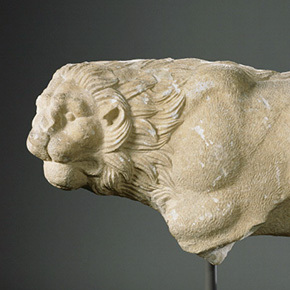 This crouching lion once presided over a family burial plot near Athens, doubling as a status symbol. The animal’s strength and ferocity made it an excellent symbolic guardian. That’s interesting: Ancient Athenian grave monuments got so over the top that they were strictly regulated in 317 B.C. Is this a girl’s headstone or a dog’s? Art historians debate. 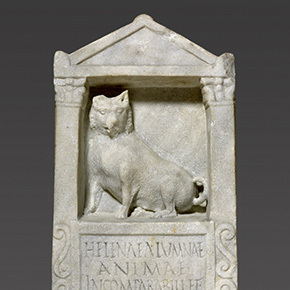 That’s interesting: Like us, the Romans owned and pampered lapdogs, and sometimes included them in funerary art. 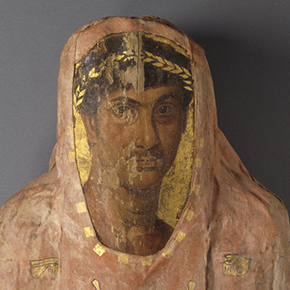 This young Roman Egyptian, Herakleides, shares his wrapper with another, smaller mummy. That’s interesting: Herakleides received a CT scan at UCLA in 2005. 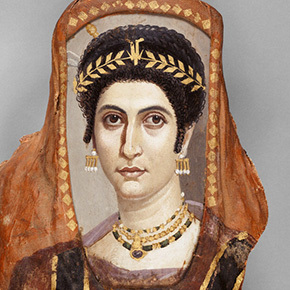 Romano-Egyptian mummy portraits like this one were inscribed with the names of the deceased to help the spirit reunite with the body. 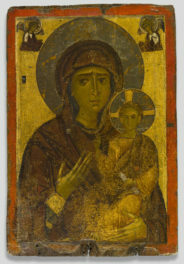 That’s interesting: Hunting for jewelry, early treasure seekers destroyed mummies and left only the portraits behind. 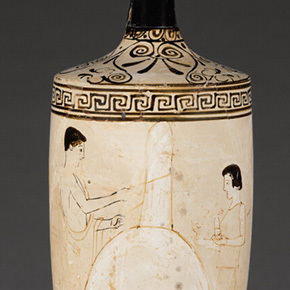 A lekythos is a small oil container used in funerary rituals. On the vase, a young man and woman decorate a gravestone with ribbons, oil, and a flower. 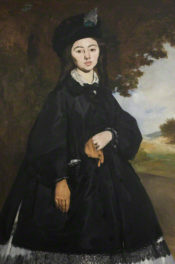 That’s interesting: This woman’s short hair could be a mourning gesture—or signify her status as a slave. This slain young man may represent one of the Niobids, children slain by the gods as punishment for their mortal mother’s boastful pride. That’s interesting: Since ancient times, artists have found beauty in the suffering and release of death. 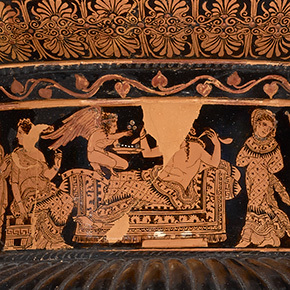 Burial in fired clay coffins was popular in East Greece in the 500s B.C. 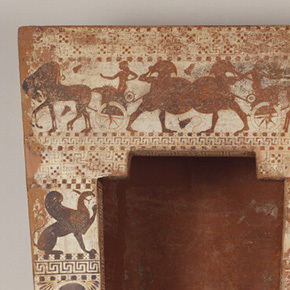 At the top of this seven-foot-tall example, two soldiers fight from facing chariots. That’s interesting: This example is rare because it preserves the body box as well as the painted frame. The Etruscans, an ancient people of central Italy, frequently decorated their tombs with wall paintings and ornaments on terracotta tiles. 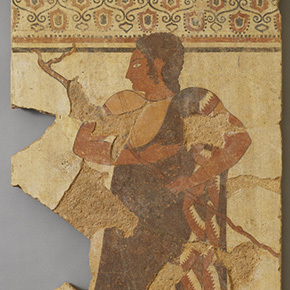 This one shows an ancient athlete. 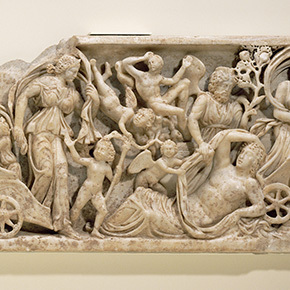 That’s interesting: Etruscan funerary paintings often depict games honoring the dead. Behold the larva convivalis, a death-themed discussion starter used at Roman dinner parties. That’s interesting: He used to be posable, and could shake and dance. 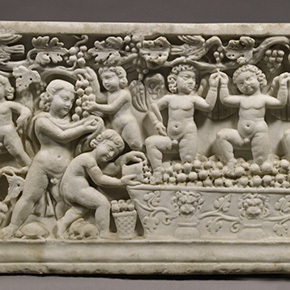 Chubby, naked infants make wine on this coffin. The grapevine, reborn annually, symbolizes transcending death. 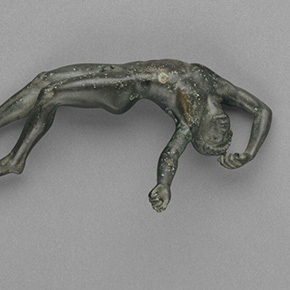 This post accompanies #DeathMatchGV, a social media project for Death Salon Getty Villa to identify the deathiest object at the Villa. Download the Death Match handout here [PDF]. Yeah, it’s like “deathy,” except more so.